Tell Tale remains at the top of the game, proving themselves once through consistent themes capped off in the excellent conclusion to The Wolf Among Us. In this article I mostly talk about the victims of the series, which for the most part encompasses everyone. Of course it's the women who largely drive the story forward and its the victimization of women in particular the game most critiques with its fable-bending twists and turns. One character that doesn't quite fit into my analysis however is Bloody Mary. The creepy mirror-walking horror is one the Crooked Man's most trusted lackey. Her appearance in the game is the first in the franchise entirely and unlike most of the others, she originates from a more contemporary mythology than the other fables. While Nerissa (The Little Mermaid), Snow White, and Beauty all come from stories with troubling gender issues, Blood Mary is not portrayed as the product of suffering in the way many of the other characters are. Even her Book of Fables entry says her history is "completely unknown". 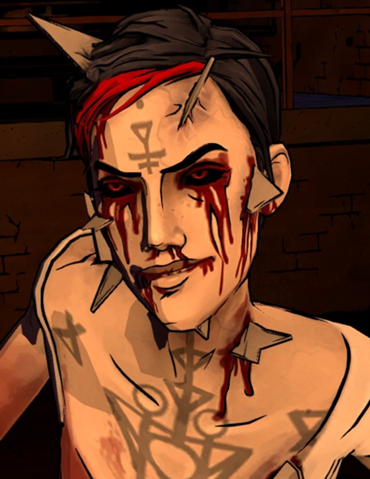 If we are to find one true "femme fatale" in the The Wolf Among Us, maybe it's Bloody Mary, though she displays none of the sexual or manipulative features of the traditional film trope. Instead, she is the game's purist form of villainy. With that in mind, maybe she serves more as a condemnation of the Crooked Man's true motives. She is the physical extension of his will, which is appropriate as he appears to suffer from physical maladies himself. Regardless of what Bloody Mary may or may not stand for, she is one of a collection of interesting and well realized characters, all of whom support the twisted noir fairytale throughout the series.